Components The LUU-2B/B flare (fig. 4-6) has four major components: 1. The mechanical timer assembly 2. The parachute suspension system 3. The out-of-line igniter 4. The case assembly with the tamped candle The mechanical timer assembly consists of a mechanical timer and related hardware in a Lexan plastic housing. The mechanical timer is a three-gear timer, powered by a torsional mainspring. A phosphorescent plastic decal with calibrated markings from 250 to 11,000 feet of fall is located on the face of the timer cover. A white, plastic, dial timer knob is used to set the desired drop distance. Settings of 250, 500, and 1,000 to 11,000 feet can be selected. A safe setting is also provided. 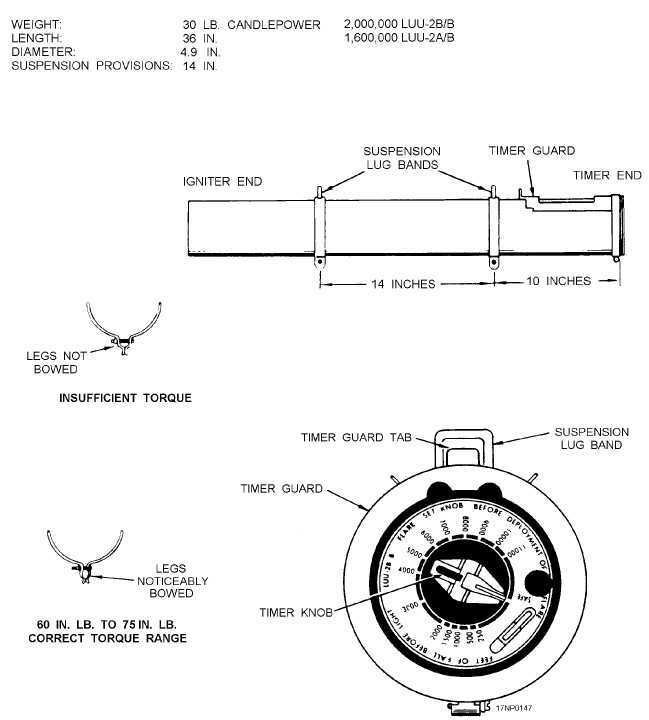 4-6 Figure 4-6.LUU-2B/B aircraft parachute flare.